What do these alarming numbers mean for HIM recruitment and staffing? How will HIM professionals prepare for new roles in privacy and security? As health data breaches continue to plague the healthcare industry, HIM will play an increasingly vital role in preventing unauthorized access to patient data and achieving regulatory compliance. HIM professionals understand the principles required to implement appropriate policies and practices to keep patient health information secure. In today’s constantly changing regulatory environment besieged by threat of breach, achieving a privacy and security credential is essential. AHIMA’s Certified in Healthcare Privacy and Security (CHPS) credential validates skills and competency in the management of privacy, security and confidentiality practices. To help prepare for the exam, AHIMA’s CHPS Exam Prep Workshop, December 7‒8 in Orlando, Florida, will provide a focused review of privacy and security rules along with in-depth coverage of the four sections of the exam. Attendees will share best practices and acquire tools to develop, manage and administer a plan to protect patient information. You’ll also receive a take-home sample test to help you study and identify areas for improvement. If the CHPS credential is a top priority for your career path, consider this opportunity to boost your success. As our profession prepares to pursue new positions, job seekers and recruiters must be well informed about emerging opportunities. 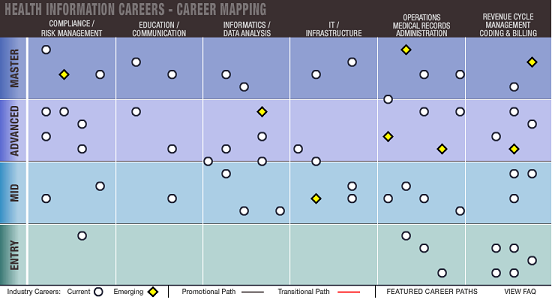 AHIMA’s career map shows various paths that encompass privacy and security roles and responsibilities. The map provides links to detailed descriptions and qualifications for various positions including Privacy Officer and Security Officer. HIPAA requires that every healthcare organization designate a privacy official. The Privacy Officer is responsible for the organization’s privacy program including development, implementation and maintenance of policies and procedures, monitoring program compliance and ensuring patients’ rights in compliance with federal and state laws. The Security Officer directs all ongoing activities related to the availability, integrity and confidentiality of the patient, provider, employee and business information in compliance with the organization’s information security policies and procedures. Responsibilities include performance of enterprise-wide training, information security risk assessments, internal audits for information security processes; monitoring technological advancements and changes in legislation and accreditation standards that affect information security…and much more. Protection of patient information has never been more challenging. In addition to these two core positions, the map shows related jobs such as Director of Risk Management, Compliance Auditor, Vice President of Security and Chief Compliance Officer—and the path to achieving each one. The success of effective privacy and security programs depends on HIM knowledge of laws and regulations that advance proper governance and management of healthcare data. HIM professionals have the unique skills, education, experience and commitment required to lead the development of privacy, security and confidentiality practices. Amid the ongoing healthcare debate, the threat of cyberattacks, the push for value-based care and other pressing issues, HIM leaders can become catalysts for change. In this time of uncertainty, are you up for the challenge? I think we need classes for compliance. I have my CHPS, but in order to get compliance training, you only get OJT, at a facility, so until you put in approx 9 months in, then your eligible to take compliance test. The one example test I took. Was mostly HIPAA based. I missed 3 out of 25 and it was a compliance test. So why isnt AHIMA offering A credential included within the CHPS, call it CHPS-C. The call it CHC, certified in hospital compliance. But there is no classes, or prep course for compliance.